Here are the fascinating gold nuggets that are worth knowing. First, the Protestant notion of the Cross & Atonement (what they call "Penal Substitution") is that a sinner's guilt is 'imputed' to an innocent substitute, which then takes the death penalty in place of the sinner. But in this case, what was Mary's (grave) "sin" here that had the death penalty hanging over Her head, which She had to then transfer onto two turtledoves? The obvious issue here is that Mary had given birth to the Messiah, Jesus. But this certainly was not a sin in any sense. Thus, Mary's sacrifices couldn't have been about imputing the guilt onto an innocent animal substitute, much less was the animal receiving the death penalty. Thus, an animal being killed in sacrifice should not be assumed to be modeling Penal Substitution. That said, a Protestant might object at say that this Mary situation doesn't affect Penal Substitution at all, since some sacrifices weren't about atoning for sin but rather simply about ritual purification. While there is truth to this claim, this Protestant "objection" actually backfires. The passage which Luke is referencing is Leviticus 12, a short chapter on childbirth ritual purification. (I brought this up in an older post, HERE) The plain fact is, Leviticus 12:6-7 explains it as "a turtledove for a sin offering, and the priest shall offer it before the Lord and make atonement for her. Then she shall be clean from the flow of her blood." Notice the explicit mention of "sin offering" and "make atonement". This is yuge because it means the sacrifice Mary had offered was not something distinct from the standard "sin offering" which Leviticus 4-5 tells us about. In other words, this is clear proof that "sin offering" and "making atonement" don't need to involve Penal Substitution. Note that Leviticus 12-15 are about various types of ritual purification, not having to do with guilt for actual sins, yet all involving "sin offering" to "make atonement". Also noteworthy is that these purification chapters come, right before Leviticus 16, which is the Day of Atonement ritual (centered on purification, see HERE and HERE). Second, note Luke's use of the term "their" in "their purification". This isn't a random detail. Luke is talking about Mary and Jesus here, about their purification. Commenting on Lev 12:2, John Calvin explains: "For although Moses seems only to speak of the mother, St. Luke [2:22], his faithful interpreter, includes also the infant." [Harmony of the Law, Volume 1 – Leviticus 12.] and Calvin again, this time commenting on Luke 2:22, says: "Let us now speak first of the purification. Luke makes it apply both to Mary and to Christ: for the pronoun αὐτῶν, of them, can have no reference whatever to Joseph." And Protestant Greek Scholar Dr Daniel Wallace wrote a short article on this "their" question of Luke 2:22, and concludes "There can be no doubt that 'their purification' is the authentic reading." This "their purification" detail is noteworthy within this discussion because some Protestants have tried to use this passage as proof that Mary was a sinner and needed cleansing. But because the term "their" is used, it then means that Jesus is now part of this sacrificial ritual, and we know that Jesus was certainly without sin. So if Jesus was undergoing it yet had no sin, then it means Mary didn't necessarily have sin just because She was also undergoing this purification. Many Catholic theologians have noted that Jesus and Mary followed the Mosaic Law even though they weren't strictly bound to certain parts (Gal 4:4-5). Catholic apologist Joe Heschmeyer speculates: "I suspect that the two spotless birds represent Jesus [sin offering] and Mary [burnt offering] – who, like the birds in Leviticus 12, are innocent, yet brought under the Law for the good of sinners." Third, this Luke passage actually mentions two liturgical rites. Above we only looked at the cleansing after child birth ritual. The other ritual is the consecration of the first-born, which we'll look at now. I want to start by noting that the term "firstborn" is tied to the priesthood and true worship, which I wrote about HERE and HERE and HERE. The instructions for consecrating the first born come as part of the Passover instructions, Exodus 13:1; 13:11-15, also restated in Numbers 18:15-16. The term used for consecrating the firstborn son is "redeemed" (a term associated with sacrificing/atoning e.g. 1 Peter 1:18-19 & Heb 9:11-15) by paying a small 'temple tax'. So by this, it could be said that Mary and Joseph were Jesus' redeemers. Haha! Fourth, going back to the text of Leviticus 12 for the cleansing in child-birth ritual, in an excellent post on Joe Heschmeyer's blog, he points out a significant detail in Leviticus 12:2 ("If a woman conceives, and bears a male child, then she shall be unclean seven days"). It turns out, the actual Hebrew word is not "conceives" but more specifically "is inseminated". Even in the above commentary already quoted, Calvin says: "to this the [Hebrew word], refers, which can only be properly translated by insemination". This is significant because all Christians agree Mary wasn't impregnated by human seed. Thus, the purification rituals don't technically apply to Mary, and thus it cannot be used as a proof text that Mary needed to purify Herself since she wasn't technically (ritually) unclean. Rather, it means that She who was without sin voluntarily underwent the Mosaic Rites, just as Her 'exempt' Son Jesus voluntarily did. Ahahaha. I see what you did there, Nick. Everyone is required to say/spell it as "yuge" during this presidency. 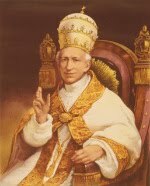 Pope Leo XIII - Pray for us! "Most desirable is it that the whole of Theology should be animated by the use of the Word of God. This is what the Fathers and great theologians of all ages have desired to practice. It was chiefly out of the Sacred Writings that they endeavoured to establish the Articles of Faith, and it was in them, together with divine Tradition, that they found the refutation of heretical error and the reasonableness of the truths of Catholicism." Imputed Righteousnesss in the New Covenant? Was Jesus damned in your place? If you have anything you'd like to discuss via email, don't hesitate to ask!